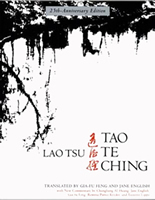 A dear Italian friend introduced me to the tao te ching in the summer of 2009. The first copy I read was one borrowed from Auckland Public Library. I caressed the pages beside the heat of a January afternoon and pondered upon the other faces and fingertips and seasons which had visited this profound text. I’ve received a response inquiring to the nature of Stephen Mitchell’s translation, and have felt compelled to post Gia-Fu Feng and Jane English’s translation also. The difference is quite remarkable. One more dogmatic, the other more ‘roomy’. I have been advised that with any translation one should refer to a number of versions. Henry spoke of a translation by Derek Lin – I shall forage. The very highest is barely known by men.